this is just fall perfection! Love all the natural elements from nature that you collected and brought in to your pretty dining room. Looks so pretty. Your dining room is one of my favorites and it looks so pretty dressed up for Fall! That's gorgeous. I love the leaves as a centerpiece. Simple, but says it all! Your fall decorations turned out beautiful! So beautiful. I love all the natural touches. And of course, the wood boards and tea light holders. The plates are gorgeous, too. And I thought I noticed this in another post, but forget to mention it. You painted your lower kitchen cabinets white again! 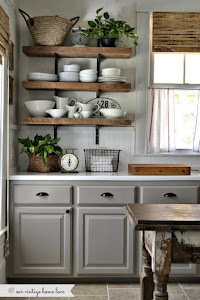 I still see the photo, from when you posted the grey and the open shelves, on Pinterest every day. It's one of my favorite kitchen pictures and apparently I'm not alone. I LOVE your chandelier & the table is amazing!! Looks so nice! I love this room! I have been looking for a chandelier similar to yours, where did you find it? I love this table! is it the same one you made (an earlier post) the legs look the same however the tabletop looks more rustic. Your blog is one of the most inspiring blogs I visit. You have style that is livable and super pretty too.